Paul climbed up on a big chunk of pushed up ice with his binoculars to get a better view of the labyrinth of pressure ice ahead. Good Ice - Bad Ice!? With only a few minor leads (long cracks in the ice with open water), we have easily made it across Barrow Strait. From the day we set out from Churchill almost 4 months ago by now, this 45 mile crossing from Somerset Island to Cornwallis Island has been on our mind. We feared for large leads, open water, and bad ice. But what we expected to be the crux of this expedition, actually turned out to be a breeze with the Polar Huskies in a flying strike making it into Resolute at 10 am after 10 hours of running. Just in time for us to get set up for another exciting Lotus Sametime Chat Session (to see a transcript click on the Lotus Sametime icon in any Collaboration Zone) Perfect timing. But as we learned more about our route ahead, we became more concerned. We learned of lots of bad ice and open water. As it turns out, the real crux might be right ahead. But before any potential trouble started keeping us awake at night, we were just very happy to see the longest leg on our journey coming to an end as we approached Resolute on Friday morning. It was a day with high sun on a blue sky filled with... sea gulls! Very weird. This strange sensation started a few days earlier traveling along Somerset Island. One morning we were awoken by screaming seagulls. Imagine this, laying in the tent on the frozen ocean surrounded by ice and snow. You hear seagulls which makes you think you are laying on the beach surrounded by sand and crushing waves. You open up your eyes, zip open the door, and of course, still find ice and snow. It was a very odd experience. We saw more and more gulls every day. As we came closer to Resolute, they were sitting on the ice locked fishing boats as if they were waiting for those boats to get released by the ice, so they could get some food! Nick, the chef at the South Camp Inn, shows off another great dinner (before Mille tears into it): Oven baked lamb with baked potatoes, delicious sauce, fresh veggies, warm bread, and home made desserts (with loooots of whipped cream of course). Talking about food... Well that’s pretty much the usual thing on our mind as we head in to a community. In the harbor, we were met with a big friendly smile and a firm handshake by Aziz (pronounced Ozzy), the owner and manager of the South Camp Inn (www.southcampinn.com). Our home to be for the next couple of days. Aziz had contacted us several months before we departed from Churchill, and has been lots of help both with "local" Nunavut information. He has also been taking care of our resupplies being sent here, talking with us on the HF radio when we were looking for a good route up Somerset Island, and finally, inviting us to stay with him at his wonderful establishment. Let us tell you - we got spoiled... and we have to admit, we enjoyed! The first meal: a big bowl of fresh salad, freshly baked bread with ham and soft brie cheese (not frozen cheese for a change), fresh warm croissants, and a bowl of steaming soup with lots of meat and veggies. Yummy. For dinner: salad, oven baked chicken with baked potatoes, fresh veggies, AND warm apple pie with LOTS of whipped cream for dessert. Mille was simply in heaven! And that's how it continued for 3 days!! In between we did do some work. We had to reload the sleds with all of our resupply about 700 lbs. worth of dog food and human food. We are not bringing much fuel now as it is so much warmer and we also went through all of our gear to sort it and leave behind anything we don't really need now that it is warmer. We left our big outer sleeping bags, all extra gloves, socks, underwear, books we have read - anything to lighten our load for the final stretch of the expedition. Monday, we had an excellent morning visiting with grade K through 8 at the Qarmartalik School. The students there had tons of good questions and obviously new all about what had happened along our way. They were very excited to meet Cassie who fought off the wolf! Grades 9 through 12 left Saturday morning to spent a week on the land with a group of exchange students from Toronto. But since they were staying at the South Camp Inn the night before their departure we did get to talk to a few of them also. Actually, we had a good time talking and meeting great people in Resolute. 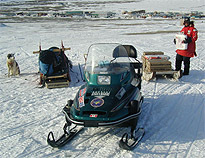 Remember the snowmobile team we met in Gjoa Haven who were going to Resolute. Well, they where gone when we arrived but they had left their one machine behind, which we borrowed to drive our resupply of Science Diet dog food down to the sled. Very typical for Resolute, there have been lots of "explorers" (or ice mice) around. While we stayed at the South Camp Inn, we were in very famous company with the Norwegian polar explorer Borge Ousland, who just came off the ice a few days earlier. 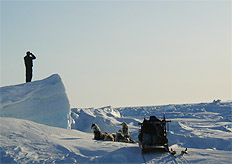 Borge had attempted a solo, unsupported crossing of the Arctic Ocean skiing with a pulk (a type of sled) from Siberia to Canada. He crossed in only 81 days (amazing!) but unfortunately he had to be supplied with a new pulk along the way. Also just arrived, was Dave Mills from Scotland (GB) with whom we spent some good time. Dave attempted to ski solo to the North Pole from Canada. He was met by very unstable ice, with fast moving open leads a couple of degrees from the Pole (120-150 miles) and decided to call for pick-up while it was still possible and safe. We are glad he took such wise decision, but (of course!) he is planning to set out for another attempt next year! Most ambitious attempt this year was, without a doubt, the Japanese explorer Mr. Kohno, who set out early spring on a impressive journey to walk and ski from the North Pole to Japan!! Tragically his journey ended as he was approaching the Canadian shore upon the long haul from the North Pole. Attempting to pass a fast moving lead Mr. Kohno drowned. His support team, which had base camp in Resolute, called for a rescue search within few days of not hearing from him. To begin with, all that was found was his pulk, skis, and ski poles. 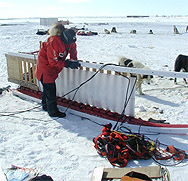 Later his support team flew out themselves to recover the body which was found between two layers of ice. Mr. Kohno was flown to Resolute, where we all grieved this terrible tragedy. About mid week, his wife and two children flew in from Japan to grieve their father. It is a reminder to us all to respect nature and her incredible power. Mutual for all of us, whether ice mice, polar explorers, Inuit hunters, or Arctic Blast team was that we were all talking about two things. Yep, you probably guessed it: weather and ice! Tales of strange weather and weird ice conditions were plentiful. As we have also seen on this expedition, the weather seemed much more unpredictable with more frequent violent winds and more extreme temperatures giving us only a short transition from cold to very warm. In the beginning of the trip, down by Churchill, we were surprised by ice crushed up all the way to shore which told us of strong fall storms. Likewise, the large amount and huge lead of open water we were met by on the east side of Boothia Peninsula is due to unusual strong spring winds. Similarly, the guys who had been out testing themselves on the multi year ice around the geographic North Pole were met by extremely windy weather conditions with winds coming from surprising directions, opposite of what is usually expected, pushing and moving ice differently from what has been seen in the past. This creates bigger and faster moving leads, earlier in the season and much more unstable ice. Talking to the locals who travel on the ice to hunt, they also describe unusual patterns. Aziz's wife, Aleeasuk is Inuk and a polar bear guide, taking people hunting from all over the world. She was born on the land in the area between Somerset Island and Boothia Pen. and travels on the ice most of the year. She told us of many changes lately. One being that the area on the east end of Cornwallis Island, the Wellington Channel, which is on our route is more pushed up with pressure ice and unstable multi ice than usual, so she suggested that we maybe make the crossing there as quick as possible even though it would mean a few more miles. Now, to us what is really interesting is that talking with these people confirms what the scientist are finding using ice probes and satellite charts - the weather and ice patterns are quickly and dramatically changing. Until now, the strongest evidence of this trend has been the stunning work of the US National Ice Center. Using submarines to measure the thickness of the ice pack they have found that it has decreased 40 percent, which is a sign of long term warming. For more information on this check out their website, where all of the details and charts have been available. Using a plane Paul is trying to level our some of the gouges in our sled runners to make the sleds glide more smooth again. As it turned out once we got the sleds on their side the gouges were really too many and too deep though. We were doing a lot of checking while in Resolute. As usual, we went over our route with locals to find the best way for us to dogsled to our next and final destination: Grise Fiord. It looked pretty straight forward, our biggest concern being where to cross Devon Island and a very large polynea (places where there is never any or very thin sea ice due to strong upwelling sea currents and winds - very important areas for wildlife) called Hells Gate just on the north east side of Devon Island stretching into Jones Sound. We had to alter our route a bit from what we had planned, to make sure to completely avoid any bad or weak ice (or fingers as they call it) created by this polynea. That just made our route a little bit longer, making us push back our arrival date for Grise Fiord a few more days. We are now planning to arrive on Monday the 11th. We need to be in town for our final Lotus Sametime Chat at 2:00pm Eastern Time. Last Sunday we got the first hint of alert. We met Hubert, a French pilot, who flew his self built air plane to the geographic North Pole this year. On his way back, just a few days before our arrival, he had noticed lots of open water in the areas we expected it, but he thought maybe also, in places we did not expect it, which was on the route we had planned. Now, as he said, it could just be low black clouds that made it look like open water. We decided that so far nobody else had talked about it, and several of the local hunters had just been in that area within the last few weeks polar bear hunting. Still, when Wayne "the weather guy" in Resolute got a hold of us Monday morning telling us to take an extra look at these ice charts he had for open water in this area as we were planning to leave that night - we did. It did not look good. According to his maps, our route was blocked by open water, on the east end of Cornwallis Island and close by Grise Fiord. The latter (if already now stretching as far as he believed) could be a real problem, when ten days from now, we would be traveling through that area. We hurried back to the South Camp Inn to download the latest satellite photos from the US National Ice Center, but with a little bit of cloud cover it is hard to tell much unless you have many images you can compare. We talked more to the locals, who all looked at us in disbelief. Finally, late that afternoon, we got a chance to visit the Polar Shelf Institute which is located next to the airport in Resolute. Here they have the top notch satellite imaging technology and they use it daily over the very area in question, so they know the images like the back of their hand. To our great relief, our planned our route of travel was confirmed to be safe! Now, in the meantime, Paul had called to Grise Fiord to talk with Ceeglok, the local wildlife officer there, to ask how the ice conditions looked around Grise Fiord. Ceeglok said he had just been crossing out onto Jones Sound the past weekend, and even though there were 6 foot open leads, he would consider it safe travel now and predicting it would stay that way until end of June. That was good news, even though the 6 foot leads will probably be 8,10, 12 feet by the time we get there meaning we will have to navigate our way around them. Just another puzzle! Being in Griffin Bay today, of course this week’s Polar Husky Star is Griffin! Now, he also happens to be the only dog who has not received a star yet, but that is not because he has not been doing great. As a matter of fact, Griffin is a close contestant to become "Puppy of the Year.” Griffin is a gentle giant. He never causes any problems, he just keeps pulling and pulling. 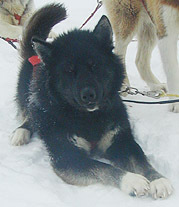 With a very mellow nature, he gets along great with his brother and running mate Hershey, and together, they often start Paul's sled. So, Tuesday we set out on our last leg of the expedition. So far, it has been good but hard travel with lots of pressure ice, which bangs us and the sleds around while Cola and Aksel take turns snailing their way through labyrinths of ice. The biggest danger though is the polar bears. This is their domain as they hunt for seals between the ice cracks. Because of the big humps of pushed up ice, almost like huge frozen waves and major chunks laying around all piled up the bears are very hard to spot. We are being very noisy, hoping not to surprise any. We are seeing tracks all over and the dogs make us nervous at times popping their heads up with ears pointing forward while sniffing the air in different directions. Today, we did have one surprise. We were sitting on the side of Paul's sled having lunch. The dogs enjoy this half an hour rest in the middle of the day where they all lay down to relax and take a catnap (or should it be called a dognap?) while we eat some soup, nuts, energy bars, and get a drink. We were munching away talking about the route ahead, with the map in front of us. All of a sudden, Paul turned his head looking over the sled and at the same time Cola, who was in lead of his team, popped her head up with pointed ears looking ahead. In a flash he saw it: a big bear slipping down behind a frozen wave large enough to hide it completely. "BEAR" he yelled out jumping to his feet. Mille, also jumping up, got so flustered she dropped the map, knocked over her nuts and almost spilled hot water down herself while frantically looking out in the distance going "where, WHERE ..I don't see any.” Then - there it was right ahead standing tall sideways on top of the frozen wave looking straight at us. Mille turned to her team. "Come on Timber, Come on Timber GOOOOOD BOY". Spook jumped up along with Spank and Timber and after a few moments of puzzlement they all started barking. The bear slid down on the other side heading away from us. In the mean time, Paul had grabbed the gun and pointing it the general direction of the bear he shot a couple of cracker shells (very noisy warning shots) up in the air, to make sure the bear would keep heading away. It did. We finished our lunch, now pretty much just gazing intensely around us for any other movement. The rest of today seemed pretty eerie. It feels like somebody is watching us. We think we almost "caught" a mother and her cub this afternoon as the dogs were flying, definitely on the hunt. We saw lots of tracks and finally saw some very fresh ones heading up into the hills on our side. Hopefully, we will make it to Devon Island - the land crossing ahead - within a day or two and have a few days with less bear worries. The only worry we have then, is whether the snow cover will still allow us to travel on land with the sleds. If not, we will have to unload the sleds and haul all of our stuff in backpacks across the land. But we’ll worry about that when time comes! For now, we are enjoying every moment we can as our journey is coming to an end. More on that next week! Also next week: our Polar Husky Winners of the Year!